You don't really take anything seriously until it happens to you, well, it did, not to me directly but to someone very close to me; a family member I love very dearly has just been diagnosed with Cancer (due to privacy would rather not say whom). Both my Mother's Parents died of it and my dear uncle passed away just last year from it as well. When I met my Husband for the first time he had just begun the radiation process due to lung cancer and by the grace of God (yes, with a capital G!) he was healed. Now, that I hear this new news, I refuse to just stand here and do nothing. Even though I feel helpless, I am not. I will continue to pray and have faith that this family member will be healed like my husband was but in the mean time I must do something. A few months back I joined the Community Service Group within the Arizona ISES Phoenix Chapter and was given the challenge to help raise funds for the Susan G. Komen Race for the Cure. Well, I donated like a good committee member should, but now that I have heard this horrible news I can't help but be more aggressive. Unfortunately, I won't be able to be a part of the race so I chose to participate in the "Sleeping in for the Cure" portion to still be able to raise even more. I am asking you; my readers, my clients, other ISES members, Vendors, Bloggers alike, friends and family to help not only raise awareness about this awful disease but join me in fighting back. I challenge you to grab your plastic cards with the 16 numbers on it and donate to the cause. 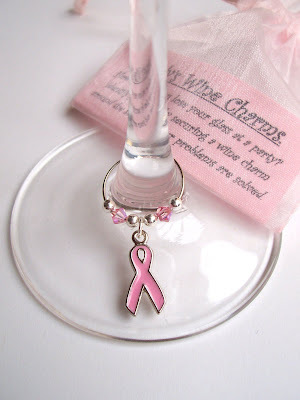 The first 10 that donate I will ship you out a wine charm (picture below) as a gift of thanks. Please click here to donate: Cicely's Fundraising Page. The race is October 14th, 2007 so please act fast.